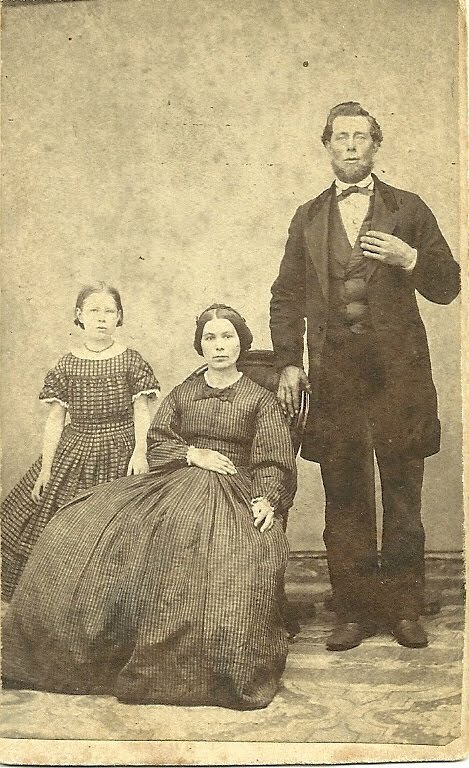 Carte de Visite of Samuel Kelley, his wife Ann Maria (Woodbury) Kelley and their daughter Fanny Ella Kelley. 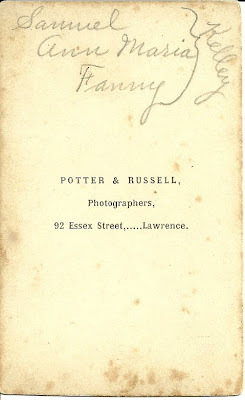 The Kelleys resided in Salem and Pelham, New Hampshire, though this CDV was made by Potter & Russell, Photographers, 92 Essex Street, Lawrence, Massachusetts. Samuel was born in Salem, New Hampshire, in 1832. His wife was born Ann Maria Woodbury in Pelham, New Hampshire, in 1835. 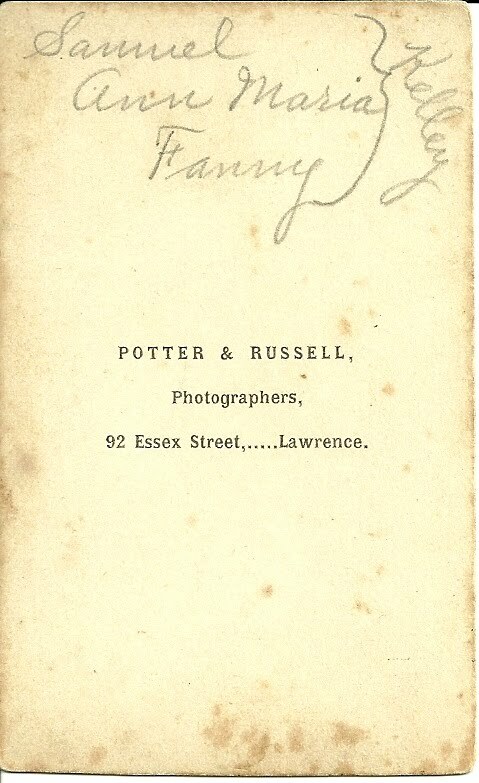 Their daughter Fanny Ella was born in Pelham, New Hampshire, in 1854. In 1876 Fanny Ella married Timothy Roberts, who was born in 1846, possibly on Vinalhaven Island, Knox County, Maine, where, according to the 1850, 1860 and 1870 Censuses, he was living with his family. After Fanny and Timothy married, they lived in Pelham, New Hampshire, Utica, New York and Quincy, Massachusetts, according to the 1880-1920 Censuses. Timothy listed his occupations as Clerk on Steamboat (1880) and Director of Music (1900 and 1910). Interestingly, Samuel Kelley operated a granite quarry in Pelham; perhaps it was the granite business that brought these folks from Pelham, New Hampshire, and Vinalhaven, Maine, together. In the 1900 Census, there is a daughter Alice M. born 1872. On the same Census, it's recorded that Timothy and Fanny married in 1876, so I'm not sure if they had a child before they were married, if Timothy was married before and he and Fanny were raising his daughter from that marriage, if Alice were a niece or other relative instead of a daughter, or if the Census enumerator made a mistake on Alice's age. Alice isn't living with them in the 1880 Census when they were enumerated in the house of Samuel and Ann Maria Kelley, Fanny's parents. I did notice an Alice E. Roberts, born in 1872, living with her parents Ezra and Susan in Brooks, Maine, on the mainland, not far from Vinalhaven. Hopefully you will find this CDV meaningful. If you have any insights into the Kelley or Roberts family, I'd very much appreciate hearing from you.